This is the second installment of homemade Halloween costumes. Check out last weeks here. The Princess became obsessed with Jessie after she watched Toy Story 2. 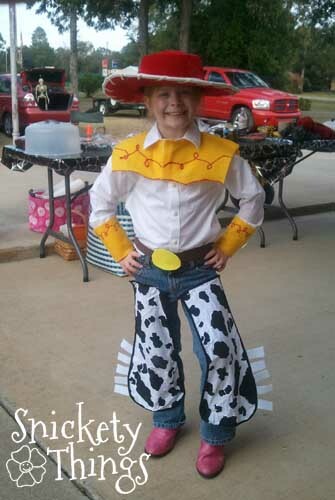 She decided that the theme of her seventh birthday party and cake would be Toy story and she wanted to dress as Jessie. I set out to figure out how to do the costume. This picture may be pinned or featured as long as it is not edited. 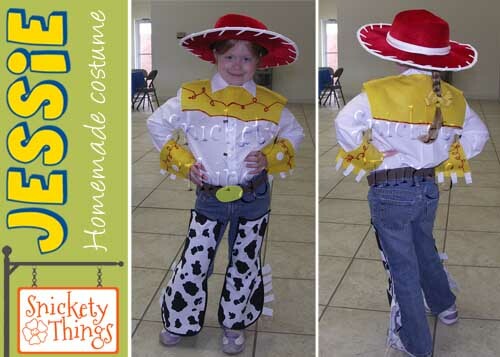 I wanted to make the costume as inexpensively as possible. White long sleeve uniform shirt from the school wardrobe, red puff paint, yellow bow and jeans. Cow print fabric, yellow felt, white stiff felt, brown and yellow craft foam, black bias tape, stick on velcro, for white buttons and the hat. I started out making the yellow portion of the shirt. Since she still had to wear the shirt to school, I didn't want to change it permanently. I used three sheets of large yellow felt to make the yoke and cuffs. For the yoke I cut one of the sheets in half and overlapped it a little at the center, then lay it on top of the other sheet. I cut a little curve at the top to be a neck hole, then sewed the pieces together along the shoulder line. Then I cut the entire yoke into the shape I needed. I put the sticky velcro on the overlapping edges at the back so it could be easily taken on and off (see picture of back below and line going down center of yoke). The other piece of yellow felt was used to make cuffs. I just cut the sheet into two strips and wrapped them around her wrist for size. I trimmed it and put velcro on to hold it closed. The white stiff felt were added with glue. I then used puff paint to make the red lines on the yoke and cuffs and added the buttons to the cuffs. I also put two of the white buttons on the cuffs. I glued two buttos to clips and used them on the front of the shirt to be Jessie's two large buttons, but they did not show up well in the picture. The belt is just a strip of brown craft foam wrapped around and a yellow craft foam buckle held together with velcro. The chaps were just cut freehand out of half a yard of cow print fabric then lined with black bias tape to cover the raw edge. As I sewed the final layer of bias tape I sewed on fringe using more of the stiff white felt. The chaps are held on with safety pins. Here is a shot of the back. 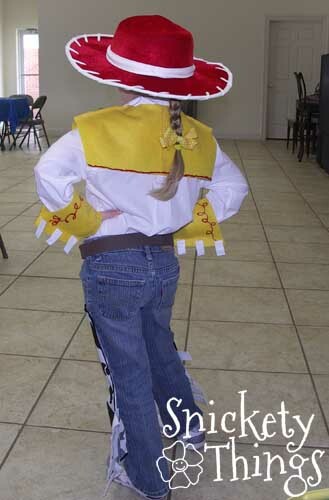 She has strawberry blond hair and it braided perfectly for the costume. $39.50 for a total, but I think you can buy a foam hat and use white puff paint to make it look like Jessie's hat. She didn't just wear this in May for her birthday, she also wore it for Halloween. Here she is at a trunk-or-treat at our church. She chose to wear her pink boots this time instead of her tennis shoes. That is so doggone cute!! Well done! great job! I looove it! Thank you! She still wears some of it although she has outgrown parts now. I love the costume, and your little girl! she is acting the part perfectly!!! Thanks! She really loves Jessie. Wow! 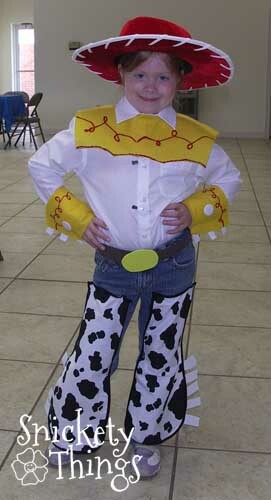 Looks just like Jessie from Toy Story - awesome!! Visiting from Sunday Scoop Link Party. Thank you! My daughter complained that the one in the store didn't look real enough either. Thank you for stopping by! Her song makes me cry, too. Thanks for stopping by! Super Cute!!! What a great job getting all that put together for that price. You can tell from the pictures that she is thrilled. I'm all about keeping my costs down. Thanks for stopping by! Doggone cute FOR SURE. Love it! And we checked them out at the Disney store and they are super expensive, so this is a great alternative. I agree. The most expensive part was the hat, if we had made it ourselves we could have easily saved $20-$25. It was part of her birthday gift so we thought it was okay. SO cute!!!! Stopping by from Serenity You, I had just had to click when I saw this featured!!! !